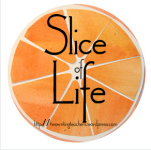 Slice of Life: Cucumbers Anyone? Slowly walking toward the garden I began to assess its progress. I hadn't been to the garden since returning from vacation. The weeds standing tall between the plants were a sure sign I needed to fight the mosquitoes and get busy. Everything looked like it needed a bit of care. I wandered around to see how the plants were doing. While the peppers and tomatoes seemed to need a bit of work, it appeared all of this rain had been perfect for cucumbers and zucchini as they were already ready to be picked. Their vines were reaching far away from their original resting spot. Walking over to the cucumber plants, I paused to take a look. The plants were intertwined and quite healthy. It wasn't long until I discovered three cucumbers more than ready to be picked. Pulling the cucumbers I brought them into the house. I looked at them for a minute to decide what I should do with them. That's when I remembered my grandma used to keep cucumbers and onions in vinegar when I was a kid. Though at that time I could do without the onions, I could eat my weight in cucumbers. The more I thought about her cucumbers; the more I knew I just had to see if I could put together this tasty snack as my grandma had years ago. Grabbing my iPad I searched Pinterest for a recipe. This didn't seem to yield a recipe I thought would work so I headed over to do a quick Google search. Finally I found a recipe that looked close: cucumber, onion, white vinegar, water, sugar and dill. Of course, checking my cupboard I realized I only had cider vinegar. I didn't feel like running into town to go to the store so cider vinegar would have to do. Cutting the cucumbers, onions, and tomatoes, I placed them into the bowl. Then combining the other ingredients I mixed them all together. I cut the sugar considerably as I couldn't imagine Grandma adding that much sugar to her cucumbers and onions. Placing them in the refrigerator I waited a bit to give them a taste. Finally I opened the container to give them a try. Delicious! Not too far off of Grandma's recipe. If I want more cucumbers, I guess I need to get busy and go out to tackle those weeds! If you have a favorite recipe for cucumbers and onions, I'd love to hear about it. As a child I spent a week each summer with my grandparents. My grandma kept us busy with picnics and adventure. Today as we motorcycled the winding hills we passed one of our favorite destinations. The memory brought today's original poem. just right for small hands. still sings in my ear. It's Poetry Friday! Stop by Google + (https://plus.google.com/103353747436744986067/posts/1WZ74Qnc34a) where Kimberley Moran hosts today's parade of wondrous words. Last week's make for the #CLMOOC took me way out of my comfort zone. As soon as the word "game" was mentioned I felt the dread creep up much as it did when I was in high school and the words "five paragraph essay" were tossed into the air. It's like a cement wall just stopped me right where I stood. I don't know why games no longer bring me comfort. As a child, I spent hours playing games with my grandparents. There was nothing like a game of Old Maid, Aggravation, Spoons, or Rummy to bring some excitement to the day. "For this Make Cycle, we invite you to use game design to analyze, remediate, and reflect on complex systems." All week I stressed over this make and had really planned to just give up. However, I had committed to this event so I needed to stay with it. Yesterday I wrote a post about your "CORE apps." These are apps you know you will use often in your classroom. It doesn't mean they're the only apps you use, but if you were helping someone get started what would be your core? I wrote the post in hopes of hearing about the CORE apps educators were using, but blogs often have little feedback. So - because I'm desperate to not drop the ball here....and there is something I want to know - I decided to play a little tag. I hope you'll play along. 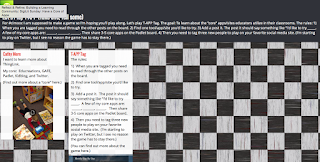 Let's play T-APP Tag. I've already started the game on Twitter, but there's no reason you can't start another game. Let's see how this will go and what I can learn from it. 1) When you are tagged you need to read through the other posts on the board. 2) Find one tool/app/site you'd like to try. 3) Add a post it. The post it should say something like "I'd like to try _____. A few of my core apps are: ______, _______, ______. Then share 3-5 core apps on the Padlet board. For six weeks I am joining the CLMOOC. MOOCs are massive online learning communities. 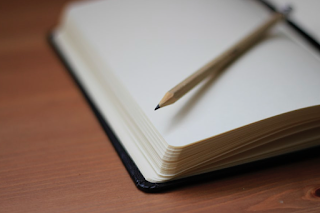 This one is offered by the Educator Innovator and powered by individuals from the The National Writing Project. It focuses on making and creating meaning through six weeks of collaborative make cycles. There is a focus for each week, a space to link up, and then ways to connect with others who are part of the project. Today I am going to combine two events: Poetry Friday and CLMOOC. This week's CLMOOC challenge is to Re(MEDIA)te something. The point, as I understand it, is to consider how the different ways we choose media to present an idea can impact the understanding our audience walks away with after reading or viewing our composition. Today I'm going to play with this idea in four steps. How does each shape your understanding? Which compositions allow you, the reader, to take more liberties and bring your own understandings to the meaning displayed and which push you more toward the message I hope to convey? Which compositions speak to you? a way to choose the order they will appear. Made on my iPhone with Phonto. Photo allows you to easily take an image and add text. It's Poetry Friday! Stop by Mainely Write as Donna hosts today's parade of wondrous words.